visit www.breckheritage.com or the Welcome Center at 203 South Main Street for details. Feb 12 7pm Getting to Yes: Are We There Yet? New Orleans take over Breckenridge with masks, boas, beads, music and revelry to celebrate the carnival season. Mardi Gras will kick off in the 100 & 200 blocks of South Main Street in Breckenridge Colorado. This free first annual "Fat Tuesday" Street Party happens from 2:00 p.m. to 5:00 p.m. on Tuesday, Feb 17,2015. 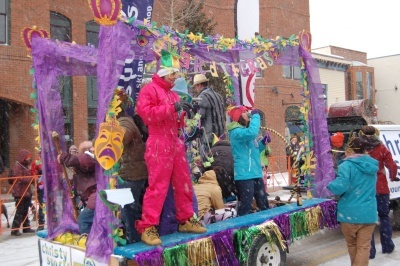 Celebrate Mardi Gras in Breckenridge with the "Fat Tuedsday" Street Party. Free concert by Chris Daniels and the Kings. FirstBank’s Capture The Cube has returned to Copper Mountain, along with even more awesomeness. This winter, FirstBank is giving away 40 Never Summer snowboards and 40 pairs of Icelantic skis. To win one, all you have to do is find an orange FirstBank cube hidden around Copper. Visit CaptureTheCube.com to learn more. On Saturday, Feb 14 the World of Adventure presents Dos Equis Après Ski for a one of a kind experience with good brew, live music and a yurt experience like no other. Challenge your friends to the feast of the brave and see how far their taste buds (and wits) will take them. Whether you’re single and ready to mingle or couples ready to cuddle, Copper Uncorked is for everyone. A unique spin on the traditional chicken wing challenge, Copper chefs will compete for the best wing recipe and wine pairing. This challenge proves that wings are more than beer and football. Our partner, Subaru believes in celebrating the love of adventure and the experiences made along the way. That's why they created Subaru WinterFest; a lifestyle tour stopping at Copper Mountain February 28th through March 1st. Join us to demo the latest equipment from Nordica and LibTech, take part in ski and ride clinics, grab some giveaways, and test your skills in the Freeride Experience. Adventure for the enthusiast and the whole family. Frisco’s 45th annual Gold Rush is the longest-running Nordic event in Colorado! The Frisco Nordic Center will host classic and skate ski races of various distances. We have new and exciting courses for the 2015 races! Racers will experience skiing on the snow-covered terrain of the Frisco Bike Park, Frisco Ski and Ride Hill! The long time races serve as a benefit to the Summit Nordic Ski Club and a portion of the proceeds raised will help send local athletes to Junior Nationals. Stop by the Frisco Gold Rush for your chance to see future Olympians compete in Middle and High School Races; the Colorado High School Activities Association (CHSAA) will bring racers from around Colorado to compete in 3k or 5k skate ski events. A community bonfire to celebrate Gold Rush Weekend! Bring your Christmas trees to add to the fire! B1 Parking Lot at the Frisco Bay Marina, 267 Marina Road, Frisco, CO. The Summit County 50+ Winter Games has been a longtime tradition. The Winter Games originally started in 1981 at the Broadmoor Hotel in Colorado Springs. In 1982, the games were held at Devils Thumb Ranch near Winter Park. The games moved to Summit County in 1983. The hosts were Arapahoe Basin and Peninsula Nordic Center. In 1984, Keystone became the Winter Games home as well as the Nordic Center in Frisco. 1985-1998 the Games were held in Breckenridge and Nordic events were at the Breckenridge Nordic Area. In 1999, Keystone Resort and the Frisco Nordic Center became home for the games until the present day. Inspired by the Bacchus Parade in New Orleans, Mardi Gras comes to Frisco Saturday, February 14th, 2015 with its own version for our four-legged friends! LAPS and The Lost Cajun Restaurant, located in Frisco and Breckenridge, are combining forces to create a costume parade for dogs and their families. The parade will travel from 2nd Street, down to 7th along the sidewalk and back up the other side of the street for a full viewing of the colorful canines and their entourage.